We’d love your help. Let us know what’s wrong with this preview of Methods of Persuasion by Nick Kolenda. Using principles from cognitive psychology, Nick Kolenda developed a unique way to subconsciously influence people's thoughts. He developed a "mind reading" stage show depicting that phenomenon, and his demonstrations have been seen by over a million people across the globe. Methods of Persuasion reveals that secret for the first time. You'll learn h Over 50,000 copies sold. Methods of Persuasion reveals that secret for the first time. You'll learn how to use those principles to influence people's thoughts in your own life. 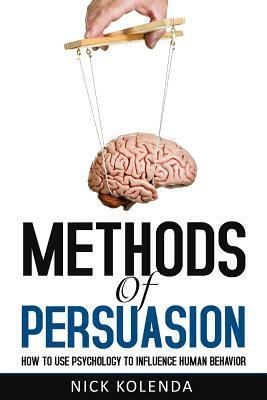 To ask other readers questions about Methods of Persuasion, please sign up. A shameless rip-off of "Influence: The Psychology of Persuasion." Written by an hobbyist, not an expert. The book reads like one of those farmed out e-books attempting to farm easy cash on Amazon. حجم عظیمی از کتابهایی که در مورد متقاعد کردن نوشته شدن، مستقیم یا غیرمستقیم تا حد زیادی تحت تاثیر مطالب کتاب «تاثیرگذاری» نوشته «رابرت کلدینی» بوده و هست. این کتاب هم استثنا نبود. چند جا که مستقیما رفرنس داده بود و مطالب دیگهای که به دیگران ارجاع داده بود هم در واقع توی همون کتاب کذایی هست، اما اینجا به روش دیگهای بیان شدن. نکته منفیاش این بود که غیر از اون مطالبی که از کتاب تاثیرگذاری "الهام" گرفته بود، تقریبا چیز جدیدی نداشت. اما نکته خوب ماجرا تمرکز به کاربرد این اصول و روشها توی زندگی روزمره حجم عظیمی از کتاب‌هایی که در مورد متقاعد کردن نوشته شدن، مستقیم یا غیرمستقیم تا حد زیادی تحت تاثیر مطالب کتاب «تاثیرگذاری» نوشته «رابرت کلدینی» بوده و هست. این کتاب هم استثنا نبود. چند جا که مستقیما رفرنس داده بود و مطالب دیگه‌ای که به دیگران ارجاع داده بود هم در واقع توی همون کتاب کذایی هست، اما اینجا به روش دیگه‌ای بیان شدن. نکته منفی‌اش این بود که غیر از اون مطالبی که از کتاب تاثیرگذاری "الهام" گرفته بود، تقریبا چیز جدیدی نداشت. اما نکته خوب ماجرا تمرکز به کاربرد این اصول و روش‌ها توی زندگی روزمره و کسب و کار بود که با مثال‌های مختلف به خوبی توضیح داده بود. نگارش کتاب هم خوب و روون بود. در کل راضی‌کننده بود. به خوندنش می‌ارزید. Excellent book on everyday psychological influences in our lives. This is not an academic book, however all the claims are backed up with studies and references. Easy to read heavy on application of this stuff in pour personal lives. One of the best books I have read on the personal application of psychology. I didn't love it, but it was interesting. There were some helpful chapters in the book if you are interested in how people are persuaded. I enjoyed this book. It is another take on how to understand the strategies of those who try to influence / persuade others to behave in a certain way. This review has been hidden because it contains spoilers. To view it, click here. 9/10: Fascinating book with an easy to remember framework for persuasion. You’ll be entertained by the numerous psychology studies ranging from the bizarre to the ridiculous. By memorising the METHODS framework presented in the book you will be equipped with a toolkit of persuasive tactics for home and work. There is a lot of useful content in this book, with very limited fluff, and you will need to read slowly and take notes to get the most from this book. This book has encouraged me to read mo 9/10: Fascinating book with an easy to remember framework for persuasion. This book has encouraged me to read more books on psychology and persuasion as the concepts contained are complex and a lot of further understanding would be required to consistently execute these methods well. •	Another anchoring technique is to ask for something very large and then ask for something relatively smaller so that the relatively smaller request seems reasonable. •	If delivering a message you could make a good first impression to provide high expectations for the rest of your message. One of the most intriguing books I've read. No Freudian mumbo-jumbo, this is an accessible and fun read on appled psychology. Some concept examples: if you PRIME the SCHEMA of OLD AGE by inserting words like walking stick, Florida and retirement homes into a questionnaire, the participants will walk out of the room more slowly! Or... people may MISATTRIBUTE the good feeling of viewing an aesthetically pleasing web site to the quality of its content. That is for sure an interesting book. I like the idea to have a clear method to follow. I guess v that when it comes to communication and persuasion, there is so much to learn that it will take time for the information to completely sink in. Furthermore, understanding is one thing, integrating the information to the level where we automatically, instinctively apply it is something else. Really interesting book, I will certainly read it again. Thoroughly enjoyed reading this book and although I feel I will need to go over it again to cerment some of the methods. I will use it as reference and have used some principles already which I have appeared l applied to my role in sales. This book offers a great step by step process not only for Persuasion of others but also for understanding how products are sold to us and how feelings are anchored to products, people and events. A really good value read and something we can all learn from. This is really good book with steps that are practical and can be used in real world situations, the author has really done hard work for the books content and it's really worth it. A great and in depth book on some very effective techniques to influence people. Kolenda uses mind games on the reader to make them aware of how the techniques work before delving into the ins and outs of them, which I think adds an amazing edge to this book. Digest this book gave amazing tools and weapons to fight among many complex scenarios. I will use techniques in compliment with other knowledges related to enneagram. ..all the time he tries to sell you more of his books (or more of this book for your friends) by implementing influencing techniques. Maybe some will follow his advice. To me this is a big let down, hence no 5 stars from me. A handbook of some tricks and methods to influence others. Certainly not an in-depth discussion about the psychology of how people are influenced but the methods outlined are quite valuable and worth learning, if at least to guard yourself against their use! Intriguing read. I always enjoy reading Nick's stuff. Will be excited when his next book comes out. It's worth a read but it doesn't introduce anything that you wouldn't already know in some manner. Great book full of usefull principles as well as strong foundation of research on which was written. Would have to read it once more definitely! Although goes too deep into scientific psychology and marketing applications of the METHODS, it was a big pleasure reading this book. The ending was unbelievably smart. A nice summary of persuasion techniques in a clear structure. Definitvamente se muestra amplio conocimiento en la rama, pero no logra conectar todos los hilos, le hace falta una vision propia de las cosas a mi parecer.. Buen libro para la practica. Learned a lot. It was very helpful! Loved all the things he had to say. Really looking forward to implementing them. Mostly standard psychology infor, but some real world applications and examples of how the author applied in this book are interesting. 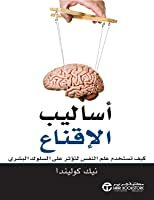 Amazing book which touches the basic theoretical and practical science of social psychology and explains how you can apply those M.E.T.H.O.D.S on a day to day basis to get what you want.